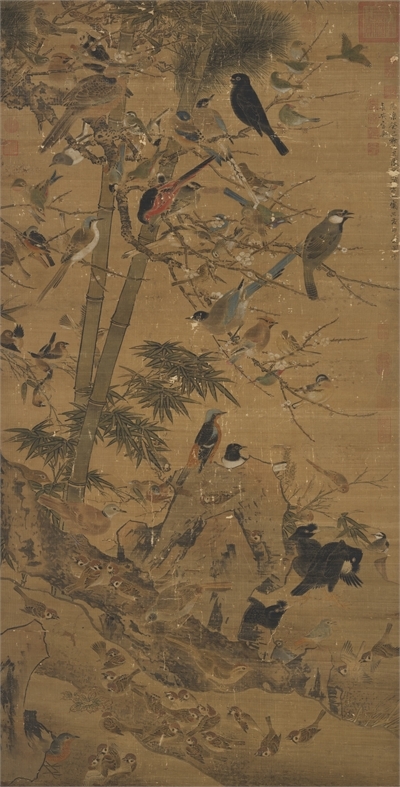 Bian Wenjin was an important bird-and-flower academic painter during the early Ming dynasty active at the Yongle (1402-1424) and Xuande (1426-1435) courts. His style followed the tradition of fine brushwork and strong colors tracing back to the Northern Song school of Huang Quan but also integrating the Southern Song Painting Academy manner. The artist's inscription on this painting reads, "In the seventh month, autumn, of 'guisi' in the Yongle reign (1413), Bian Jingzhao (Wenjin) of Longxi painted 'Three Friends' and a Hundred Birds at the official's residence in Chang'an." In ancient times, people referred to the capital as "Chang'an," meaning that this painting was done in Nanjing, the capital at the time, and perhaps on imperial order. The pine, bamboo, and plum tree form the main framework of the composition along with the slope. Interspersed among them are nearly a hundred birds, creating a strongly decorative effect. The outlines of the slope and plum tree as well as the brushwork for the texturing are slightly relaxed, but the painting as a whole generally still falls within the tradition of outlines filled with ink and colors. The style, opulent yet refined, represents a classic example of court taste.